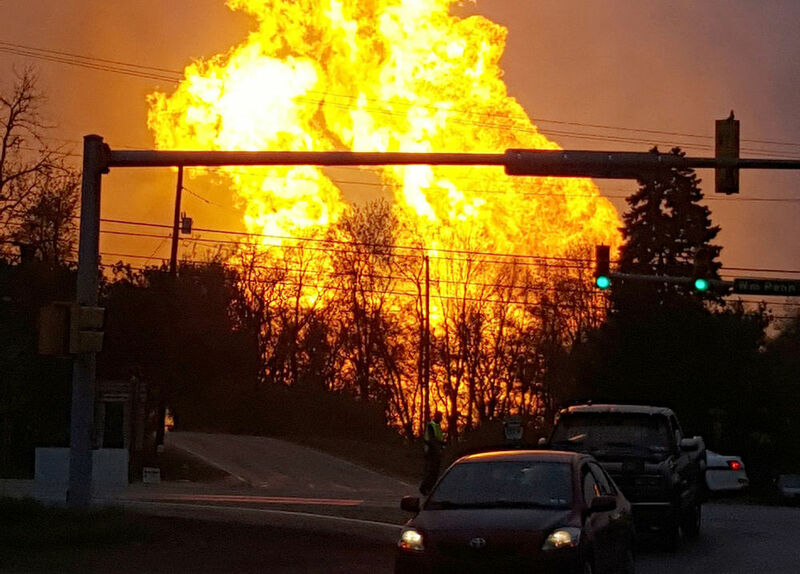 An explosion along a Spectra pipeline in Salem Township, Penn. resulted in a serious injury, and "blew a 12 foot deep, 1500 square foot hole and scorched 40 acres." The investigation is ongoing, but "the preliminary investigation shows evidence of corrosion on the pipeline." According to Bloomberg News, Spectra claimed "force majeure" the day-of the accident. Per Bloomberg: "Force majeure is declared to remove a company from contractual obligation because of events beyond its control." WEYMOUTH – The Texas company looking to build a natural gas compressor station in North Weymouth has been touting its commitment to meet all federal safety mandates for months. But a subsidiary company of Spectra Energy was fined twice by federal regulators in the past six years for failing to meet safety standards and other requirements at its facilities, including a gas-detecting alarm system that was improperly calibrated for more than a year at a Connecticut compressor station, records show. Spectra says the violations were “primarily administrative in nature,” and were quickly fixed. But opponents of the proposal, including public officials and resident groups in Weymouth, Quincy and Braintree, say the fines bolster their case that the compressor station in a densely populated area near the Fore River would pose a safety and health hazard to residents, businesses and commuters. An explosion at an Oasis Midstream Services, LLCcompressor station located north of Watford City on Highway 1806 on Wednesday, Dec. 23, not only set off an automatic 911 call, but is raising concerns from McKenzie County officials as to the proximity that many oilfield structures are being built in regards to residential homes. LITTLE ROCK, Ark. (AP) — Federal inspectors found several violations during their most recent review of Spectra Energy’s Texas Eastern Transmission system, which includes the pipeline that burst last month in the Arkansas River. Spectra Energy was cited during the 2011 inspection for three violations, including failure to inspect sections of pipe for corrosion, and was required to pay a civil penalty of $134,500, according to reports by the U.S. Department of Transportation’s Pipeline and Hazardous Materials Safety Administration. The 24-inch pipeline ruptured May 31, and roughly 4 million cubic feet of natural gas flooded in the river. ARTEMAS, PA - Volunteer firefighters work at the Columbia Gas Transmission compressor station in Artemas, Pa., Thursday morning where an explosion and fire forced the evacuation of several dozen residents. SEARSMONT — A team of engineers remains at a Spectra Energy pipeline compressor station in Searsmont attempting to determine why a pressure valve blew Dec. 31, sending a tower of gas 100 feet into the cold night air. Meanwhile, the station has been shut down, while gas continues to run through the pipeline to other compressor stations in Maine. “Engineers are on the ground reviewing it,” said Spectra spokeswoman Susan Waller, from the company’s Houston corporate office, almost a week after the incident shook residents awake within a 10-mile radius just before midnight New Year’s Eve. (KTVI) - An explosion rocked a natural gas plant near Houstonia, Missouri halfway between Kansas City and Columbia. Compressor stations in the eastern United States have been plagued by an outbreak of fires and public protests over the past two months. BRANCHBURG — A flash fire at a natural gas pipeline compression facility sent two construction workers to local hospitals and caused minor injuries to about 13 persons, authorities said. 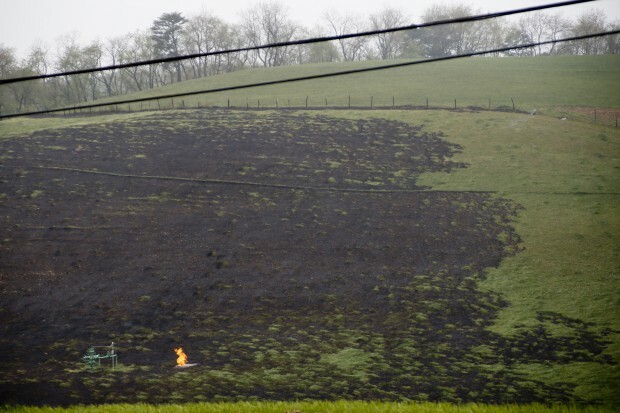 "At about 7 p.m. (Thursday) we had a flash fire at a construction project at our natural gas compression station," Chris Stockton, a spokesman for the Williams Corporation, operator of the Transco Pipeline. "Two individuals were taken to a local hospital with non-life-threatening injuries, there was no damage to the station, and it occured on a non-active piece of pipeline." Brooklyn Township, PA (WBNG Binghamton) Pennsylvania DEP officials say there is evidence of an explosion at a gas compressor station that caught fire late Tuesday night in Brooklyn Township. The Pennsylvania Department of Environmental Protection has sent air quality inspectors to look at the Williams Compressor Station. The compressor station in the 100 block of Turnpike Road in Brooklyn Township, near Montrose, caught fire shortly after 11 p.m. Tuesday. WELLSTON, Oklahoma - We're learning more about an explosion at a large natural gas compressor in Logan County, Thursday night. Wellston, Okla. residents have seen big grassfires before, but not anything like the blaze at the DCP Midstream compressor plant around 9:30 p.m. Thursday. A compressor caught fire Monday afternoon at a natural gas well site on Oakland Road. The fire, at a BHP Billiton site, began after a compression station engine exploded. The fire lasted for about an hour before BHP employees arrived to shut off a feeder line. About 35 to 40 people in 20 or more homes were evacuated during the event. They were allowed to return home within about 90 minutes, according to Van Buren County Office of Emergency coordinator Jeana Williams. Sheriff Scott Bradley said the homes were evacuated due to concerns about the dangers from a gas fire. Two workers were hospitalized after a Compressor Station in Carbon County exploded. Fire crews from four towns were called in, but in the end allowed the fire to burn itself out. "I come upstairs, because I like to watch the lightning and the storms," said Engler. "I was up in the picture window watching the lightning hit the hill and everything and then all of sudden, the lightening just hit the compressor station and there were flames, hundreds of feet up in the air." State Police, Windsor Fire, and Broome County Fire all responded, and immediately called an evacuation. SPRINGVILLE TWP. - An explosion at a natural gas compressor station in Susquehanna County on Thursday morning blew a hole in the roof of the complex holding the engines, shaking homes as far as a half-mile away and drawing emergency responders from nearby counties.